SAGE Online 14 is here and we’ve begun rolling out the update to subscribers. With over 150 new additions, the latest release brings a few industry-firsts and I’m super excited to share with you three new big features you need to know. Why three? Because who has time to read about all 150? So grab a fresh cup of coffee and let’s get started! Create custom catalogs or flyers in just a few clicks! 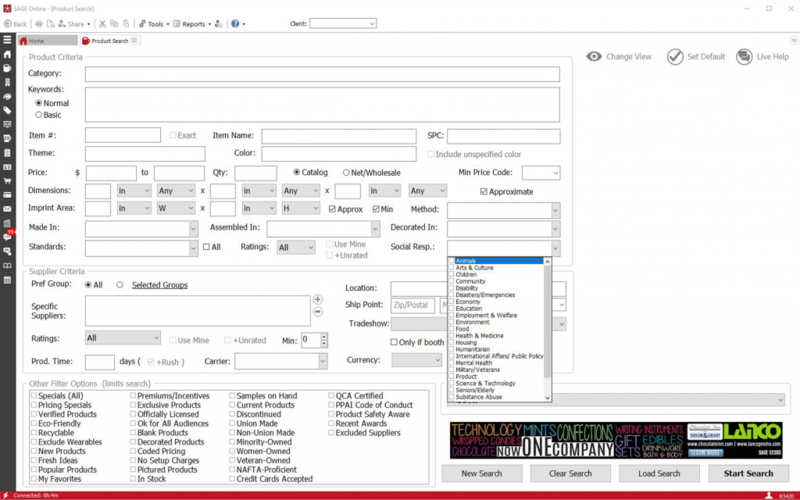 This is THE staff favorite – the new Print Studio module! You’ll see it located in the left menu towards the bottom. This new module makes it easy for you to create custom catalogs and flyers using pre-designed layouts. Are you thinking “OK, great, but what does that mean?” I’ll explain. Every year, we sell hundreds of thousands of Inspire catalogs and we’ve had a few subscribers ask if they can pick their own products. The answer was no. BUT now, you can! With the new Print Studio module, you can create a catalog or flyer and add whatever products you want. How about taking a custom catalog along to your next sales meeting? All you have to do is create a catalog filled with the products you want to showcase. You can even take it a step further and add their logo (with the Virtual Design Studio) to each product to really impress your client. Or how about creating a catalog to promote your top sellers and most popular products? You can create that in the Print Studio too! You can save the catalog as a virtual flipbook. Check out a sample flipbook here! This is my personal favorite. You can copy the URL and send it to your customers, post it on social media (“Check out our new promotional catalog!”) or add a hyperlink to it in your email signature! There’s a ton of things you could do with this, and it’s free! There’s no additional cost to create a flipbook. The third option is to select “Email Flipbook”. When you click this option, it will automatically open a link to the flipbook in your email, so you can easily send it out. You can also select “Copy Flipbook URL” which saves you the extra step of opening the flipbook in your browser and copying the link from there. When you click “Copy Flipbook URL” this automatically copies the link so you can paste it wherever you like. Lastly, you can select “Save as PDF”. This option allows you to save a PDF version of the catalog to add to your website. 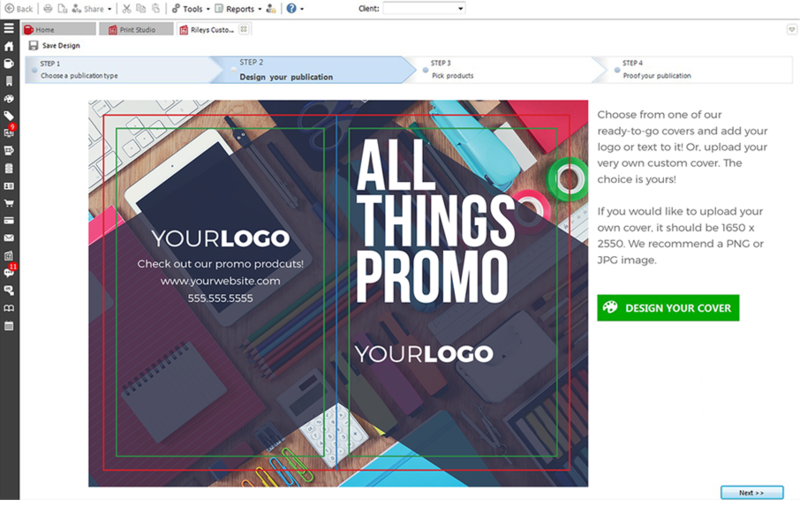 You can learn all the ins and outs of the brand new SAGE Print Studio here! Quickly process payments directly in SAGE Online! The next feature you need to know about is the new “Payments” option. 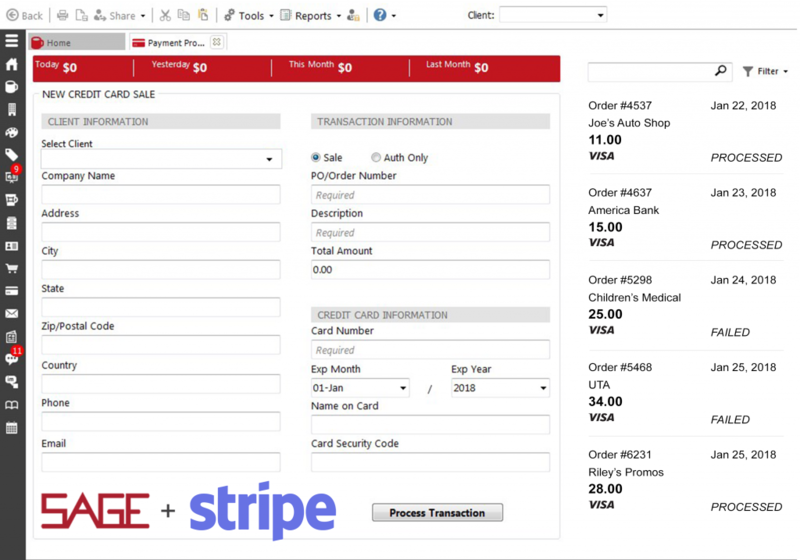 We’ve partnered with Stripe, a leading e-commerce provider, and now you can process payments directly in SAGE Online. There’s always been the option for you to process payments in SAGE Mobile, SAGE Web, and in the admin section of sagemember.com, but now you can streamline your payments within SAGE Online to make things just a little more efficient! First, the payment information will tie into the SAGE CRM module. This means you can select your client from the drop-down option in the top menu and their company information will automatically appear so you don’t have to rekey anything. Second, the charge will appear in that client’s history so you’ll have an ongoing recording of orders placed. These are just a few handy features of SAGE Payment Processing — see the low rates and how easy it is to get started. Contribute to a worthy cause with the social responsibility search. There are multiple studies that show consumers (especially millennials) are willing to pay more for goods and services from socially responsible companies. And now, we’ve made it easy for you to find products from suppliers who participate in social responsibility programs. The new social responsibility program search functionality appears in the product research dashboard in SAGE Online under “Social Resp”. This is an industry-first option and we are so proud to offer it! You can search and/or filter products that are associated with give-back or social responsibility programs by selecting the specific causes that are of interest. From causes like children’s health, homeless, education, the environment, and so many more, you’ll be able to connect with suppliers dedicated to giving back to their communities. Interested in what else is new? You can see more of the top features of SAGE Online 14 here! SAGE Online 14 is rolling out now! If you’re currently a SAGE subscriber, you will receive an “update available” prompt when logging in to SAGE Online. Not yet experienced all SAGE Total Access has to offer? Try it free for 30 days and see what you think! You’ll not only get access to the new SAGE Online 14, but you’ll also be able to try SAGE Web and SAGE Mobile to manage your business from anywhere.